Sizes: 6-9 months., 12-18 months., Cap: head girth: 37-40 cm, socks: 10-12 cm. You will need: for a blouse 150 (200) g, for pants 150 (200) g, for a hat 50 g, for socks 50 g blue 00053 Schachenmayr Micro Bamboo yarn (50% viscose (bamboo), 50% polyacryl, 145 m / 50 d), for a blouse 5 (6) buttons, for pants 4 buttons, needles No. 4, circular needles No. 3 and No. 4, set of stocking needles No. 4, hook No. 3. Facial smoothness: persons. R. - persons. n., izn. R. - ex. R.; in a circle. R. all n. knit persons. Pattern in the box: knit according to scheme A for model 1. Repeat 6 p. Of rapport, finish with loops after rapport. Repeat from 1st to 6th p.
Attention! Jacket to armhole knits in a single canvas. The back and shelves: dial 125 (143) p., Link 1 out. R. from n and knit with a checkered pattern. Through 13 (15) cm in persons. R. divide the work: tie 29 (32) p. patterns for the right shelf and set aside, close 7 p. for the right armhole, knit 53 (65) n. patterns for the back and set aside, close 7 p. for the left armhole, for the remaining 29 ( 32) n. Knit left shelf. After 20.5 (24) cm for the neck close 1 x 6 p. On the left side, in each 2nd p. 1 x 3 p., 1 x 2 p. And 2 x 1 p. After 25 (28.5) cm, close the remaining 16 (19) p. Of the shoulder. Right shelf knit symmetrically. Finish the backrest by 53 (65) points and after 25 (28.5) cm, close all points. Sleeves: dial 37 (43) p., Link 1 out. R. from n and knit pattern starting from chrome. and 1 persons. At the same time for bevels on both sides add 12 x 1 p. In each 4th p. (3 x 1 p. In every 6th p. And 9 x 1 p. In every 4th p.) = 61 (67) p. Through 17 (19) cm from the start of work, close all p.
Assembly: perform shoulder seams, sew the sleeves, perform the seams of the sleeves. For the collar around the edge of the neckline, dial 83 (95) p., Tie 1 p. individuals. p. 6 p. individuals. stitch and 18 p. with a checkered pattern, close all p. Tie the edges of the blouse 1 p. Art. b / n and 1 p. as follows: 1 rev. p., * 1 pico (3 air. p. and 1 tbsp. b / n in the 1st air p.), skip 1 p., 1 tbsp. b / n, repeat from *, 1 tbsp. b / n in 1st vozd. Sew on buttons, fasten them on the picot loops. Right leg: on the stocking needles dial 40 (48) p. And knit persons. satin stitch. 5th round. R. knit as follows: * 2 p. together persons., 1 nakid, repeat from *. Next, knit the faces. satin stitch. In the 11th circle. R. from the typesetting edge knit 1 persons. cross after each 2nd paragraph 20 (24) times = 60 (72) paragraph = 15 (18) paragraph on each spoke. At the same time, add a paragraph as follows: in the 7th (8th) lap. R. 1 time, then in every 7th (8th) lap. R. 6 times knit up to 1 p. From the end on the 2nd needle, knit 1 person. cross, knit the last P.; on the 3rd knitting needle, tie the 1st point and tie 1 person. cross = 74 (86) p. After 22 (24) cm, distribute the p. On the spokes 2 and 3 and knit the wedge with straight and inverse p., Closing 1 x 2 p. On both sides and in each of the 2nd p. 1 x 2 p. And 3 x 1 p. = 60 (72) p. Postpone all p.
Left leg knit symmetrically. Add after the 1st paragraph on the 1st spoke and before the last. n. on the 4th knitting needle, then on the 1st and 4th knitting needles to knit wedges. Back and front:knit 30 (36) p. wedge of the right leg, 60 (72) n. of the left leg and the remaining 30 (36) n. of the right leg and knit a circle. R. individuals. stitch on 120 (144) p., the beginning of a circle. R. = right lateral "seam". After 16 (18) cm, knit a checkered pattern, after 3 cm of a checkered pattern, divide the work as follows: knit 56 (68) n. For the back, close 8 n. For the left armhole, knit 52 (64) n. For the front and put aside, close 8 sts for the right armhole, on the remaining 52 (64) sts knit back. 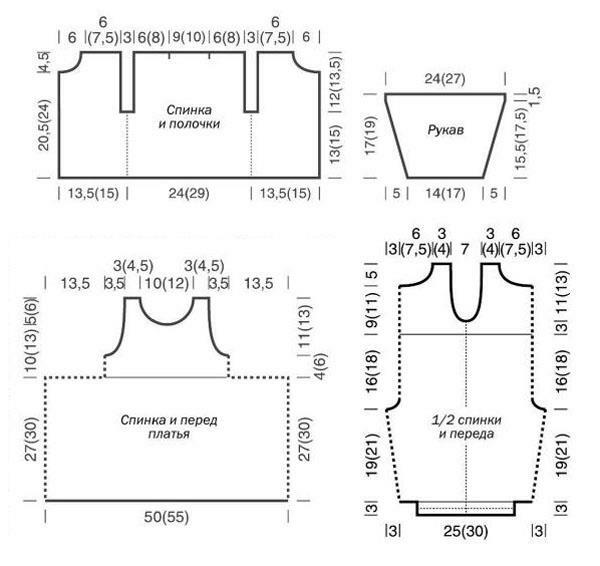 Simultaneously close for armholes on both sides in each 2nd p. 1 x 2 p. And 2 x 1 p. = 44 (56) p. After 9 (11) cm of the checkered pattern for the neckline, close the middle 10 (14) p. And knit further separately, closing along the edges of the cutout in each 2 m p. 1 x 4 p., 1 x (2 x) 2 p. And 2 x 1 p. After 52 (58) cm, close the remaining 9 (11) p. Of each shoulder. Just tie in front of pants. Assembly: tuck 1.5 cm of each leg to the holes and sew. The edges of armholes, neck and straps tie 1 p. Art. b / n and 1 p. pico, as for a blouse. Sew 2 buttons to the straps in front and fasten them on the loops of the pico straps back. Cap - job description: on the stocking needles dial 90 (96) p. And knit a circle. R. individuals. satin stitch. 5th round. R. knit as follows: * 2 p. together persons., 1 nakid, repeat from *. Connect another 5 circle. R. individuals. stitch and knit pattern in the box. After 10 (12) cm from the openwork row, mark 10 (12) times every 9th (8th) item and knit each marked item with the previous item together of persons. = 80 (84) p. Next, knit people. stitch and knit each marked paragraph with the previous paragraph together persons. 1 time in the 2nd p. and 1 time a trace. R. = 60 p. Then in each circle. R. knit 2 pp together persons. The remaining 15 p. To tighten the working thread. Turn the edge along the openwork row and sew. The height of the cap is 12 (14) cm. Make 3 pom-poms with a diameter of 3 cm and sew to the cap. Twist 2 laces with a length of 40 cm and sew to the cap. Description of knitting socks: on the stocking needles dial 36 (42) p., Link 1 circle. R. individuals. n. and 12 (15) circle. R. pattern in the cell. Run openwork circle, row: * nakid, 2 p. Together persons., Repeat from *, subtract 2 p. Only for size 12 cm, tying 2 x 3 p. Together persons. instead of 2 = 36 (40) p. Next, knit persons. stitch: in the 1st circle. R. provyazyvat all nakidy persons. = 9 (10) n. On each spoke. When the height of the top of the sock is 6 (7) cm, knit the foot of the person. satin stitch. Knit Circle, p. heel on 18 (20) n. on the 1st and 4th knitting needles. 1st half of the heel: 1st p. (Pers. ): to knit all the points on the 1st spoke of the faces., turn the work. 2nd p. (izn. ): knit 1 double paragraph as follows: position the thread before work, insert the needle into the 1st paragraph, remove the paragraph and thread together, move the thread to the back side of the work and pull tight, thus forming a double paragraph Again, transfer the thread to the front of the work and knit wear. the remaining points on the 1st spoke and all points on the 4th spoke, turn the work. 3rd b.: Knit 1 double st., Knit persons. all other sections on the 4th and 1st needles to double points at the end of the river, leaving the double points unbound; turn the work. 4th b.: Knit 1 double n., Knit again izn. to double n .; turn the work. Repeat the 3rd and 4th p., Until there is 6 (8) n in the middle. Then tie 2 circle. R. on all n. and in the 1st round. R. raise both parts of double p. and knit together individuals. as 1 p.
Then knit the 2nd half of the heel: 1st p. (persons. ): to knit persons. 3 (4) p. Middle plot on the 1st spoke and 1 track, p., Turn the work. 2nd p. (izn. ): knit 1 double n., 6 (8) n. middle section and 1 trace. n. izn., turn the work. 3rd b.: Knit 1 double n. Then knit persons. to double n., knit it and trace. n. persons., turn the work. 4th b.: Knit 1 double n. Knit izn. to double n., knit it and the trace, n. izn., turn the work. Repeat the 3rd and 4th p., Until on the 1st and 4th knitting needles there is 1 double paragraph on the outer heel. After turning last. from R. tie another 1 double st., knit the faces. the remaining items on the 4th needle, then knit the faces. the surface of the circle. R. on all n. and in the 1st round. R. to knit double p. persons. When the length of the foot is 8 (9.5) cm, knit the toe as follows: 2 p. Together persons. at the beginning of each knitting needle in each circle, p., until 8 p. remain. The remaining hinges are tightened with a working thread. Tie the upper edges of the socks 1 p. Art. b / n and 1 circle. R. pico, as for a blouse. For each sock, make 1 lace with a length of 50 cm in two threads, stretch them into the holes, starting and ending in the middle of the front of the sock, and tie them to a bow.